LOVE IS Organic Denim Gumdrop Girls Jeans - Free Shipping! Clearance item. No returns or exchanges. ALL SALES FINAL. Over a half pound of chemicals are involved in producing a pair of conventional denim jeans. That's why you asked us for organic denim kids' jeans. We looked at so many brands before we finally found LOVE IS Organic Denim--the softest, most comfortable organic denim children's jeans available. These great girls jeans were recently featured in Cookie Magazine! 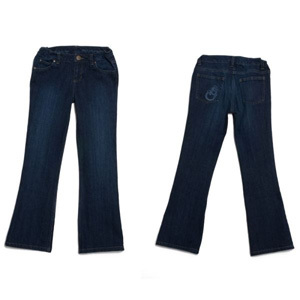 And for good reason: This is the pair of jeans that your daughter will want to wear everyday. 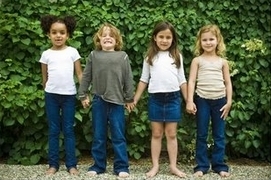 Gumdrop Jeans are not a shrunken down adult style--they are designed and made just for kids. These irresistibly soft 100% organic denim jeans feature an adjustable waist for the perfect fit and longest wear. The jeans also have a comfy medium rise and are not too low in the back (so no peeking underwear). The leg has a fashionable slight flare, and the jeans have no itchy tags or bothersome grommets. These jeans are meant to be worn, handed down, and even transformed. To that end, every pair of jeans comes with an organic denim patch to help the jeans last longer or to let kids really make the jeans their own. Note: These jeans run long and will shrink about 1/4" after washing and drying. They also hug the waist snugly. E-mail us at info@urthchild.com if you would like measurements. For us, it was LOVE at first sight with these jeans. One look and feel of these incredibly soft organic, fair trade denim jeans, and we knew that we had found the absolute best organic jeans on the market. Control Union Certifications-Certified Organic Cotton: LOVE IS organic denim jeans are certified organic and fair trade from seed to packaging. Control Union Certifications (formerly SKAL), a USDA Accredited Certifying Agent, certifies their organic cotton, from the fields through cleaning, carding, combing, spinning, weaving, and finishing. The jeans are completely sourced and sewn in India. Chemical-Free Dyes: LOVE IS uses natural indigo to color their jeans. Indigo has a low environmental impact, is azo-free, and is free from heavy metals and halogens. The jeans are also certified organic after dying. LOVE IS Organic Denim is based in Greenwich, Connecticut, and was founded by Kristin Fine and Katie Stein. Through LOVE IS Organic Denim, Kristin and Katie hoped to combine their reverence for kids' energy, ingenuity, and imagination with thoughtful design. In addition, Kristin and Katie ensure that LOVE IS Organic Denim gives back to others. Proceeds of sales from their jeans support local and global organizations that make a positive impact in the lives of children.